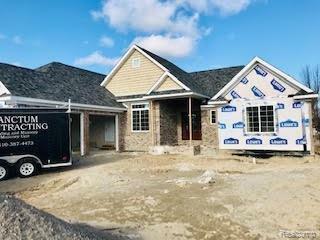 LUXURY RANCH NEW CONSTRUCTION IN ST CLAIR TWP! BE THE FIRST TO CALL THIS BRICK RANCH HOME! IF YOU LOVE UPGRADES THIS IS IT! HOME FEATURES INCLUDE MASTER SUITE WITH A BEAUTIFULLY DONE MASTER BATH, LARGE STUDY/FORMAL DINING RM, SPACIOUS OPEN CONCEPT FLOOR PLAN, UPGRADED KITCHEN CABINETS WITH SOFT CLOSE DRAWERS, GRANITE KITCHEN COUNTERS, SPACIOUS PANTRY, FIREPLACE IN LIVING RM, CENTRAL AIR, HARDWOOD FLOORS AND CERAMIC FLOORING, UPGRADED LIGHTING AND CEILING FAN PACKAGE, UPGRADED BATHROOM VANITIES WITH DOUBLE SINKS IN BOTH FULL BATHS, FULL BASEMENT WITH MOST MECHANICAL'S ON ONE SIDE OF BASEMENT AND SO MUCH MORE! THIS IS A RARE FIND IN ONE OF ST CLAIR TWPS MOST SOUGHT AFTER SUBDIVISION! HOME IS NEAR COMPLETION CALL FOR MORE DETAILS OR PRIVATE SHOWINGS! PHOTO QUALITY WAS RESTRICTED BY HOME WHILE IN CONSTRUCTION.